Earlier in the week Traci shared some great information with you about Adding a Round of Golf to your Walt Disney World vacation. With Valentines Day coming up, we thought we'd put together some great gear for the golf loving man in your life, you could even use to announce that you've added some time on the links for him during your next trip. A soft and classic navy polo with pair of plaid shorts is just the thing to look smart on the course. Embroidered with the 2015 logo this shirt also makes for a sporty souvenir. 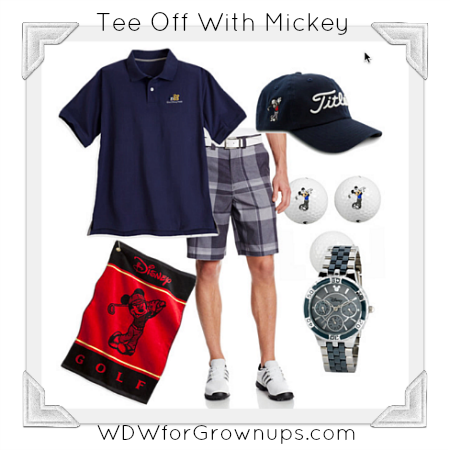 Load up your gear bag with Mickey Golf Balls and a handy cotton golf towel to show off your spirit. The Piece de resistance though is a stunning watch that features a deep gray face, and tracks month, day and time under a Mickey icon. *The links in the post above are affiliate links. Prices were accurate at time of publication, and as with all things Disney, are subject to change without notice.